A range-restricted species occurring in a remote area where it is not threatened. It is likely to be more common and widespread than records indicate, as its habitat remains botanically poorly explored, and it is easily overlooked. This species occurs in a remote area where there is little human impact on its habitat. Apart from the potential threat of habitat loss to mining, it is unlikely to have any threats. 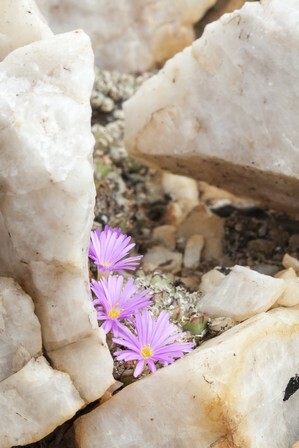 Conophytum species are popular with succulent collectors, but are easily grown from seed, and is unlikely to suffer extensive declines due to removal of mature individuals from the wild. This species is locally abundant within suitable habitat (Hammer 2001). It is currently known from a single subpopulation, but occurs in a remote and poorly explored area, and it is likely that other subpopulations exist. Plants are extremely small and cryptic and could easily be overlooked. Population size at the type locality is estimated to be <1000 plants. Hammer, S.A. 2009. Conophytum confessional: three new species from South Africa. Cactus and Succulent Journal 81(4):191-195.